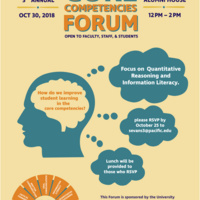 The Core Competencies Forum is designed to bring faculty, staff, and students together to discuss how to improve student learning in the core competencies. This year will focus on the results of two competencies -- Quantitative Reasoning and Information Literacy. How well are students learning to locate, evaluate, and use information? How well do students transfer quantitative reasoning beyond the discipline? How should programs teach and assess undergraduate core competencies? Come and find out at the Core Competencies Forum! Please RSVP to Sandy Evans by Oct. 25.